Transformations™ first came alive through the artwork of Bruce Flye. Last week Sam Ray returned from Kenya where the Center for Creative Leadership is running a monthly Self Awareness course through April 2016 at East Africa‘s Regional Leadership Center for the Young African Leaders Initiative (YALI). CCL senior faculty member David Hudnut published Leaps in Perspective on the Strategy + Business blog on Sept. 30. His piece explores the theory that people develop in fits and starts with sudden bursts of growth, as opposed to developing in a steady, gradual fashion. Thanks to HRDQ for making this video of our webinar free for our users. David K. Hurst used Leadership Metaphor Explorer in Washington DC last week with a global corporate client, and we are glad to have this report. Thanks David! Last week I spent a day-and-a-half with a group of senior managers from a large global company discussing leadership. The company faces all the challenges one might expect it to face – globalization, digitization, cross-cultural difficulties and so on in a VUCA world i.e. one that is Volatile, Uncertain, Complex and Ambiguous. The CCL Early Leadership Toolkit features several Leadership Explorer tools (Visual Explorer, Values Explorer, and Leadership Metaphor Explorer). Leadership Metaphor Explorer is a tool for helping a group or team think with more energy, insight, and creativity about the present and future of their work together. This post comes from Amanda Kowal Kenyon, SVP, Director, Organizational Development, Ketchum. Ketchum is a leading global public relations firm, and is developing a more interdependent leadership culture. “As Director of OD for Ketchum I have the privilege to serve as a facilitator of leadership team alignment workshops. We help teams carve out dedicated time to productively discuss issues and arrive at high-value decisions. In this work, I often call upon metaphor-based exercises to help participants make more meaningful, thoughtful contributions and foster intellectually interesting conversations. One of my favorite tools is from the Center for Creative Leadership. 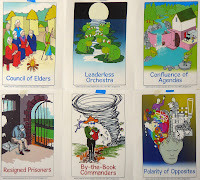 Their Leadership Metaphor Explorer cards are ideal for helping a group think deeply about the aspects of leadership that resonate in their organizations today as well as their aspirations for leadership tomorrow. 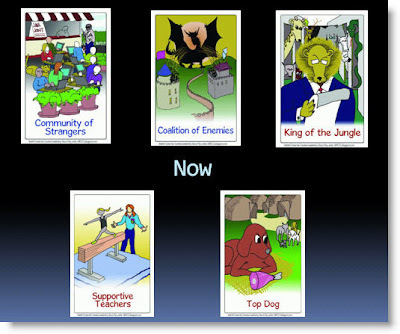 The cards offer an extensive variety of postcard-size illustrations depicting myriad leadership metaphors such as Ambitious Pioneers, Co-creating Musicians, and Motivational Coaches. This video from a LME session in Second Life (AMI Conference, 2008, University of the Pacific) is fun and interesting. The virtual interactive world of Second Life uses the digital versions of the cards as huge posters on the walls. In this prototype version the labels were still hand drawn. People and strange animals fly through the air. A serious dialogue on innovation ensued! Virtual meeting spaces can be effective for leadership development and coaching, weaving rich webs of resources with virtual social presence and interaction. Now let’s go back further still in the history and origins of Leadership Metaphor Explorer. Metaphors (including analogies) are tools for creative thinkers of any kind—artists, scientists, engineers, managers, and leaders— to understand and change the world. Leadership Metaphor Explorer engages people in playful yet deeply serious conversations about developing leadership and culture. Around 1992 Dr. Robert Burkhart and David Magellan Horth developed a personal development process called Root Metaphor. Root Metaphors are core personal metaphors which define how we approach life and work. One of those for me is my second name Magellan. Imagine how someone lives his life believing he descended from the first person who circumnavigated the world. The Root Metaphor exercise developed by Burkhart and myself was featured in CCL’s Leading Creatively program. I often describe the activity as a right brain goal setting activity. Participants typically discovered and developed their own personal Root Metaphor that became a resource for their continuing leadership journey. In our book The Leader’s Edge we wrote about images and metaphors as tools for thinking, being, and acting in a complex world. Visual Explorer was our first dialogue tool based in images and metaphors. We introduced the idea of “mediated” dialogue, or making meaning together by “putting something in the middle” of the conversation (Palus & Drath, 2001). Images, we learned, are especially effective for mediated dialogue. In the CCL program called Navigating Complex Challenges, Andre Martin, David Horth, Ancella Livers and others used a set of 49 verbal metaphors, in words but without images, to enhance classroom dialogue about options for navigating complexity. It worked! But the words by themselves seemed flat. 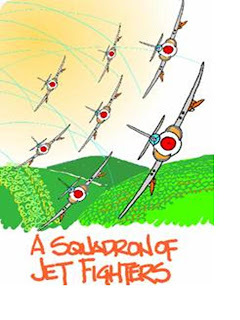 David recruited graphic facilitator and strategy guru Bruce Flye at East Carolina University to draw images for the metaphors. Bruce met David when they were co-facilitating the Crisis Leadership Forum hosted by CCL to examine the essentials for leadership in a crisis such as the New Orleans Katrina disaster. Bruce is a fine graphic facilitator. By going back and forth between ideas and drawings we further extended the set across the spectrum of dependent, independent, and interdependent metaphors (as coded by an expert panel). By means of rapid prototyping we provided beta LME decks for testing to faculty around CCL, especially working with Steadman Harrison and Lyndon Rego in the Leadership Beyond Boundaries initiative with diverse and global constituencies for leadership development and social change in Africa, Asia, the Middle East and the USA. General Richard L. Hughes tested the LME cards as part of a culture survey at the U.S. Air Force Academy, and describes them in his leadership textbook. Later they were successfully used in boundary spanning work with U.S. Forces and the Department of State in Iraq. Several publications show LME has been further applied to boundary spanning and interdependent leadership (Hughes et al., 2011; Palus, McGuire & Ernst, 2011). Steadman Harrison from the Center for Creative Leadership took these great photos at the HMC Conference at St. Andrews, Scotland. More on global leadership at Leadership Beyond Boundaries. Here are collages from a different venue that Steadman also shared, from his work with the organization ChildFund. Our colleague Tom Hickok at the Department of Defense as been using Leadership Metaphor Explorer for team building, and for teaching management topics at Virginia Tech. In the note below he shares his successful recent experience using LME in his System Skills course. I took out the Leadership Metaphor Explorer (LME) cards two nights ago and used them with my Systems Skills for Managers class at Virginia Tech. I have 21 students in the class, all studying for their MPA. They are almost all engaged in the workforce, with some in federal and local government, some in the private sector (contracting to the federal government, and some in the non-profit sector. It has been one of those classes filled with positive energy, which has made it an especially fun semester for me. Then I turned to the LME exercise. People were instructed to pick LME cards which spoke to them about a challenge at work, or an opportunity to get through the challenge. Students were instructed to let their table-mates (3 or 4 to a table) describe the cards before they say why they picked them. People spent about 10 minutes or a bit less selecting the cards and 20-plus minutes at the tables. What a buzz! Every table lit up. Once again, the point proved out that visual images are an amazing entryway into dialogue. me. In the de-brief, the students pointed out there were some polarities where people who had picked the cards saw positive where there table-mates saw negative. In retrospect, I could have asked a more individual question such as what insight they gained from their team-mates or to describe their challenges to the group. But the feedback on the exercise was entirely positive. The Land that Time Forgot…. … is Eastern North Carolina when healthcare reform requirements are robust–but the economy is chronically weak and there is no government funding support for the legislation. Our colleague Bruce Flye has done really fine strategy work using scenario-creating conversations. In this case he is facilitating his home institution, The Brody School of Medicine (BSOM). The full story is posted on his blog Making Voices Visible. 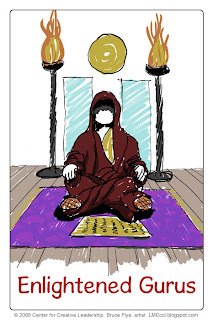 I have excerpted key parts connected to his use of the LME cards within digital artifacts such as the Vue mapping tool, and in his hand rendered graphic illustrations. Regardless, thousands of new patients are entering the system. But with renewed commitment to the need. In late 2009 the Dean sent me a review of Scenarios: The Art of Strategic Conversation by Kees van der Heijden. His note said simply “A different form of visioning?” I was still relatively new, and I wondered what his intent was, but I decided I better get a copy and read it. The approach advocated was stunning, in part because the rationale merged many things I had learned in other disciplines. The principles of systems thinking, visual language and Appreciative Inquiry were coming together although not necessarily explicitly. Overall, the strong argument for emergent practice and participative approach resonated. While reading Strategic Conversations, I was aware that BSOM “had a strategic plan,” but I was also aware that the Dean, having been here just two years, was already thinking differently. In many ways he was in a mindset of Ackoff’s Idealized Design. Wouldn’t it be great if we had a few more people to think along with him? Engaging with Scenarios would allow us to map the current system and the trends in the external context. To assure relevancy in the scenarios we began with one-on-one interviews of 26 of the leaders in our BSOM community –faculty, chairs, administrators, board members and hospital executives. The protocol was designed to elicit what they were thinking about and paying attention to. Handwritten interview notes were then transcribed into mindmaps, and these were then separated into external and internal subject matter, with the internal being those over which we can exercise some control. The external issues were organized by the themes that seemed to emerge from the interviews. This was done by a qualitative analysis using the mind maps to explore relevancies. After informally testing these for reasonableness with a few individuals, a report was compiled for distribution to the scenario team. To assemble the team, the Dean invited 25 people who were good thinkers and who collectively represented a cross-section of the school. Another component of van der Heijden’s process is The Business Idea, typically a visual depiction of a positive reinforcing loop that describes what we believe is actually happening when we perform well; it also translates into a simple narrative. Transcending static statements of values and vision, it portrays a living “engine of success” as we see it. One way of testing the accuracy of a Business Idea is to ask “Is it reflective of how we think and act as an organization?” An accurate depiction is useful in that it can be compared to the scenarios and adjustments made accordingly. It’s highest and best use, however, is in stimulating conversations about the relationship between thinking and acting. The Business Idea here was shared in a short workshop with the department chairs. In small teams we had them converse about the depiction and the questions it raises. At the end we asked for a “fist vote” of how well it represents our thinking. Although there was confusion about the Business Idea versus a business model (and even a vision) we seemed to be fairly well on target. Until this point all of the analysis, preparation and distribution had been done by just me; now it was time to turn it over to the Scenario Team. Contrary to the norm, the first workshop did not begin with presentation and debate about the findings to date. We stipulated in advance that the material must be read before the workshop, and we began processing it with a focused conversation designed to see what people were thinking without the need to get to any kind of agreement. Working in small groups, the team was tasked with a process of working with the 11 themes in the report and deriving the Critical Uncertainties that should be considered in our stories. 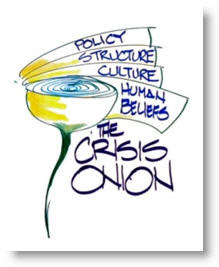 These then were the material for a second workshop in which we invited John Prescott to come in as our “outsider” and comment on the Critical Uncertainties. John stayed and worked with us as we identifies important drivers of the future, their polar outcomes and ultimately the two dimension around which we would develop four scenarios. As we reached this point close to the holidays, writing the scenarios took three separate workshops. Our first was a “beta” with just a few of us to test the methodology. One of the things we discovered was that visual tools helped the necessary conversations take off really fast. The next two scenarios were written in a Monday morning workshop just a few days before Christmas. We helped two small groups through a process wherein they first developed an end state, and then they crafted a narrative around how it would come about. To capture their narratives without bogging down over writing, we had a videographer come in at the end of the meeting to capture the stories as they were verbally presented using the graphic material on the tables. The last scenario was written in a bar. In an effort to get people together quickly after Christmas, I offered to buy the beer; I was also curious about the interaction of alcohol and creativity. In some ways, this evening produced an especially crisp view of the future. This work grabs some but not others. The interviews with the leadership were almost all lengthy and intense, with the leaders energetically engaged. The initial workshop with the scenario team was also a high engagement event; however, only two thirds of that team stayed with us for the duration. The energy in these conversations about the outside world suggest that although it’s not the school’s usual subject matter we are constantly thinking about it. Naming the four scenarios seemed to help have more presence in our interactions. The workshops themselves were carefully scripted, but the actual work was carried out by self-organizing teams. They were quick to grasp the intent, and willing to work hard. We found that we really can interact in forms other than debate, and that there is a higher than expected tolerance for ambiguity. Doing this work as visually as possible seemed to be a real help. Graphic templates made the more complicated components easily manageable by the teams. Visual tools like Visual Explorer and Leadership Metaphor Explorer seemed to actually productively jump-start conversations. 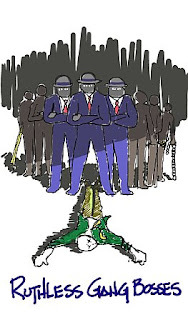 The final narratives were posted on a website along with details of the process. Attention is being called to them in arenas such as the full faculty meeting and the Dean’s Blog. Since their completion, they have served as the launch point for a strategy initiative that will focus initially on the creation of Premium Partnerships for the School. It is anticipated that the Business Idea will resurface as a framework for new directions. The Explorer tools easily lend themselves to compelling and useful digital graphics. In this example Bruce Flye uses both Visual Explorer and Leadership Metaphor Explorer in helping this team of departmental leaders create their narrative for intentional change. The print version is huge–six and a half feet long. In that version the narrative text is layered into the “gray space” of the graphic. The online Prezi version zooms to the hi-res detail, which can include photos, charts, and so on (the Explorer cards can be individually photographed and incorporated). This digital artifact allows further reflection and dialogue as the narrative is put into action, and helps bring newcomers up to speed quickly. “Idealized Design begins with a systems analysis of the current situation, in this instance provided by a fictional case study representing a campus with an assortment of issues. Once their analyses were complete, we asked them to consider the current leadership culture. To do this we used Leadership Metaphor Explorer, a tool developed by the Center for Creative Leadership with a little help from yours truly. 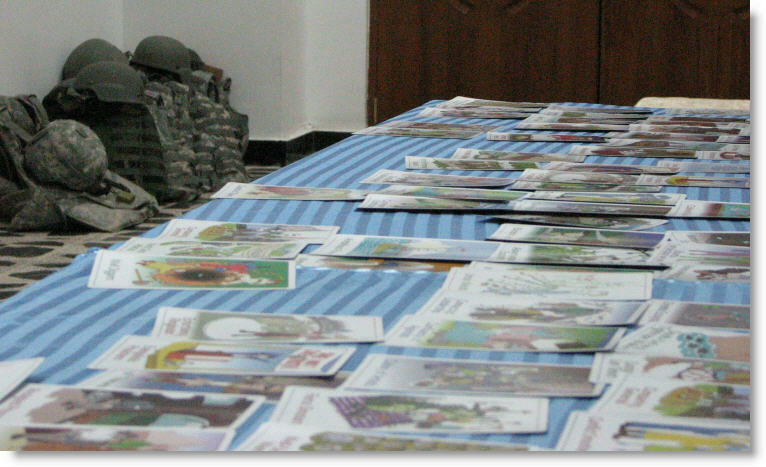 All of the cards were spread out on a table, and we asked the 18 participants to review each. They then picked the one that seemed most like their situation or, if none seemed to work, they picked the card that spoke to them in some way. As they were working in three groups of six, we asked them to return to their groups and then share their cards and their thinking in turn. Each group was then asked to agree on two cards from their six that seemed to best represent the leadership culture in place on this fictional campus. We then took the two cards from each group and set them aside without discussion. As the week went by they developed their Idealized Designs. Rather than beginning with the usual mission statement, we worked with Steve Haeckel’s Reason for Being. Pretty quickly, they produced this statement: “Walnut College Food Service exists to provide students with healthy and sustainable food options in an environment that enables them to become successful individuals.” Once each group had drafted its Idealized Design, we borrowed from Appreciative Inquiry and crafted Provocative Propositions to guide the subsequent work as opposed to the traditional gap analysis. Once they had worked their way through the additional details, we asked them to return to a question of leadership: “What is the leadership culture that will give life to the Idealized Design and its Provocative Propositions?” We repeated the selection of metaphor cards, and then posted both sets for comparison. The original six, as they described them, depicted a conservative and insular environment. “A Confluence of Agendas” to them represented people each getting something for themselves while the larger whole slowly deteriorated. A “Leaderless Orchestra” to them was an indication of a poorly functioning entity. With the new set, they were quick to see a distinct shift toward an interdependent leadership culture. Even metaphors not normally associated with interdependency had a role in creating it: “Nurturing Parents” reflected the fact that someone would have to teach these new skills and behaviors; “High Performance Engines” described how the college’s senior leadership was going to have to step up its game in order to keep up with the dining services group. 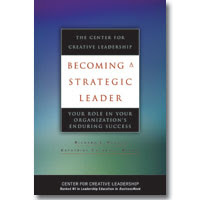 For more on the design of leadership strategy, see this Center for Creative Leadership white paper. Leadership Metaphor Explorer™ was reviewed in Choice magazine , volume 9, number 1. Clemson and I were talking about the Metaphor Explorer and he asked if I had ever used it cross culturally and outside of the US. Upon reflection, the only time I had was when I was in Prague. Clemson was curious about how some of the cards are being received in less democratic locations. He mentioned some of the cards are very western/democratic and was curious: does anyone have some insight into this? Thanks! In the last month I’ve used the Leadership Metaphor Explorer deck in Sudan, Kenya, Uganda, and Ethiopia–quite a range of governance and culture and language. The UN-IFAD team here in Khartoum will be taking LME with them as we head to the field tomorrow… heading down South to Rufaa and over to Wad Arakay on the edge of the desert… the entire training will be in Arabic and the locals won’t be able to read the English subtitles on the cards… should be a great test to see how they are received! My sense is that the newest deck is more global… we’ve replaced a few of the cards and updated some of the other pictures. Just a quick update… from Sudan. Here’s a way to use Leadership Metaphor Explorer™ for supporting strategic thinking during an online conference. Thanks to strategy and creativity mavens Kate Beatty and David M. Horth. I am doing some final work on my slides for the upcoming Jossey-Bass online conference. I am doing a workshop on strategic leadership, and would like to include several of the Leadership Metaphor Explorer cards in an exercise. At the beginning of the session, I will have them identify a strategic challenge they are working on. When we discuss strategic thinking, I want to give them the opportunity to reframe their challenge, and thought that showing several of the cards would be a good prompt for this. Can you direct me to the electronic images of these cards? Here is the online source for one at a time downloading. How it looks when we are at our worst? How it looks when we are at our most innovative? How it needs to look like in the future? How it needs to look like to resolve the major challenges we face? Can culture be intentionally changed? Here is a re-post from CEO.com sampling John and Gary’s great new book. Leadership Metaphor Explorer™ is keyed to stages of leadership culture and is often used in organizational leadership development. Here is a summary of their book, Transforming Your Leadership Culture. In an extract from their book Transforming Your Leadership Culture, authors Gary Rhodes and John McGuire examine how leaders can change an organisation’s culture. There is a logic to any persisting culture. A culture’s collection of beliefs and norms fits together in a meaningful way. For example, one system of leadership logic, which we call Dependent – Conformer, centres on the idea that a leader gives an order for someone else to carry out. This type of culture excludes non-official leaders from participating in the leadership collective. It leaves them and their potential waiting indefinitely to emerge. Bruce Flye is the talented artist and facilitator that helped us create LME. Here are his reflections of how it all got started. I was there, but I’m still not completely sure what happened. Here’s what I recall. 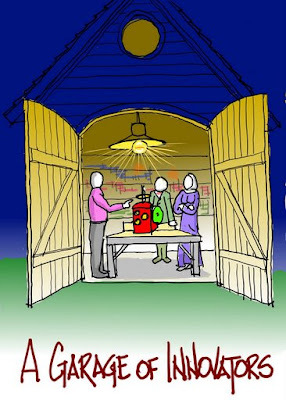 In early 2007 CCL invited me to graphically record their C risis Leadership Forum, an event that is a story unto itself. 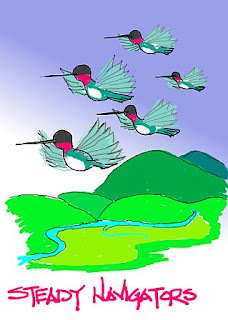 On the second day I was approached by David Magellan Horth, one of the forum’s co-leaders, who asked if I might be interested in illustrating some metaphors they were working on. My initial reaction was one of alarm, and I barely contained my first thought: “I’m not a graphic artist and, furthermore, this is the first time I’ve ever done graphic recording!” Fortunately I went with my second thought and asked “Is this the style of illustration you have in mind?” as we looked at the work on wall before us. David said it was exactly what he had in mind, and from there we went to work. David and Chuck Palus provided an initial spreadsheet of 35 metaphors that were to be followed by an additional 25 or so still in development. Many of these early phrases prompted immediate images: Courageous Lion Tamers, Death-Defying Tightrope Walkers, Enlightened Gurus. I began generating sketches and e-mailing them in “for review and comment” as we say in the construction business, but I soon found I was in an environment to which I was absolutely unaccustomed. There weren’t many comments on the drawings, and instead they sent more metaphors. It took awhile to realize that I had stepped into a very open-minded culture that trusted emergent process. Over many months we did about 55 or so cards and my work was considered complete. Over all that time I had learned much about metaphors, and had also begun to find myself a style with a tablet PC. Back in my day job, when I was called in to address a very tricky relationship issue within our Health Sciences Division I found I could crank out my observations via metaphor pretty quickly. Then, when David sent a note and asked if I could do another 20 or so for LME, I found they could now flow out rather smoothly. Check that; the production could flow smoothly. Conception was another matter altogether! What were they thinking: Confluence of Agendas? Silicon Valley of Innovation? Network of Peers? Well, we did those, too, and not that differently from the first set in that it was highly virtual collaboration. There were occasional e-mails, and a phone call every now and then, but I didn’t appreciate what was going on until we noted at the end that we had completed this fairly involved product without ever meeting face to face. A few of these have become remembrances of a special time in my life. One of the very few hints I was given about their intentions came from David for the Leaderless Orchestra: it’s about positive functioning. When he later saw the frogs on a pond he wryly commented “That’s some imagination you have there.” We actually talked in advance about possible content for Non-Violent Resistors, but while drawing it the violence was so palpable I sent it in asking them to look at it critically as I wasn’t sure they wanted everyone to have the sensations it gave me. And then the whole deck AND the experience of it coalesced into Ubuntu. Writing this now, it occurs to me that this work with David and Chuck has itself become a very powerful metaphor. But that’s another post. 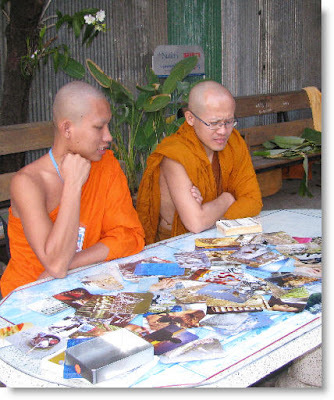 M chose two pictures, one to answer the question of how a monk should be a leader in the community and one to answer the question of how he wished to be a leader. Both intersected in the theme of “know thyself.” For M, the most important part of leadership is knowing onself first. Only when we know ourselves, can we then lead others. 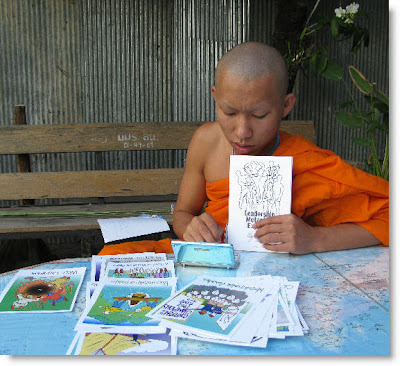 He also chose several other cards to represent the various aspects of leadership a monk exhibits. But the crux of the issue was self-knowledge. … >>more at the YLead blog. Here’s another interesting and useful field report from Tom Hickok at DoD. Thanks Tom. 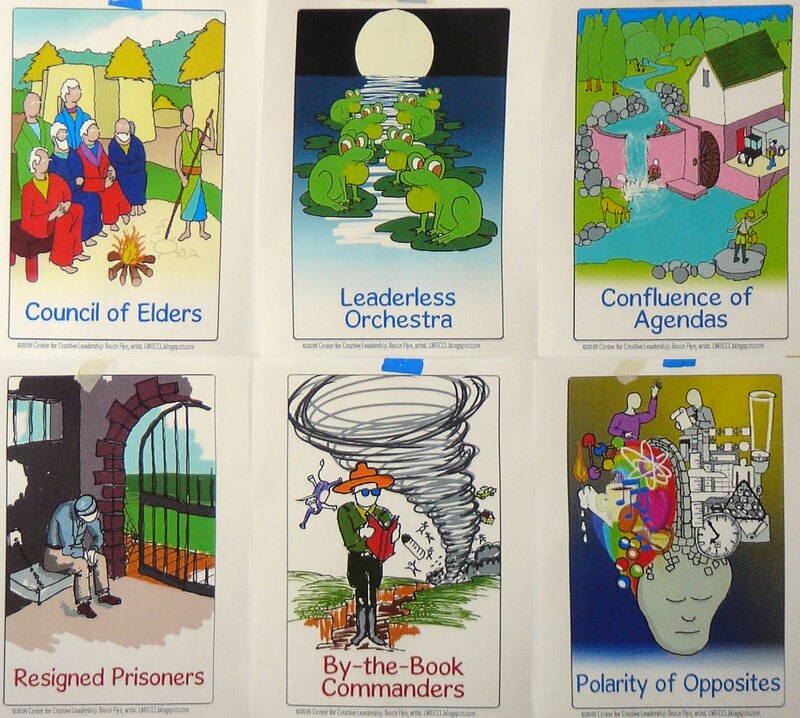 I used the leadership metaphor explorer (LME) cards yesterday in a team-building off-site. The group that I support in the Department of Defense environment almost doubled in the last few months, from about 18 to about 30. The off-site was planned to be largely a fun event for this group, with pizza lunch with time afterwards to socialize and relax. 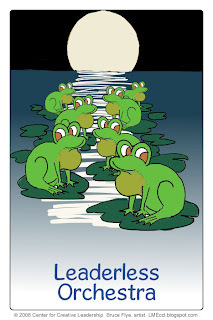 But there was a team-building exercise at the front end and I used the LME cards as part of it. The design of the exercise was for the division director to make some comments about some changes ahead. The purpose of those comments was to get the group thinking seriously about change/change management. When the director finished speaking, I followed on his talk with the theme of “initiating change within a sea of change.” After a word about the purpose of teambuilding, I asked the 23 participants to browse the cards, and pick one that they related to in some way, or spoke to them about the challenges/opportunities ahead. They did that, and reconvened, with chairs arranged in a circle to allow good face to face contact. I asked them to share briefly about why they picked the card they did, and any brief story behind it. Everybody shared willingly, without extra pressure. A few people shared about parts of their personal background that were previously undisclosed. Others talked about their work goals. Comments after were very positive about the experience. Some things to note: 1) The LME exercise was compressed to about 35 minutes because we started as lunch approached, and I didn’t want to start a hunger strike, so I assured them at the beginning of the length of the exercise :)) 2) My design consideration in having the whole group share instead of breaking into sub-groups was to help facilitate relationships across the whole team. Also, the limited time didn’t really support a two step feedback process (small teams to large teams). 3) I kept the sharing very short due to the time constraints. We could have productively shared much longer (at least another hour), I believe. I continue to be impressed with the versatility of the LME cards at drawing people out to talk at a significant, or even profound level, in a short period of time. I appreciate the chance to use the cards, and I think they are very ready for prime time. I even had colleagues ask me after the exercise where they could order the cards (one wanted to use them in her church, which has a new leadership team). We used the LME with our media client last week as we originally conceived the exercise: the participants explored leadership behaviors that enable and disable innovation. It was a memorable exercise in that it got the participants up on their feet so they could view the cards as well as stimulating fascinating dialog surrounding the questions. It was remarkable what people saw, how they interpreted it and then how they pursued consensus given their perspectives. I intend to share our experience at the AMI meeting in Banff. I’d be glad to elaborate more on the experience with you if you are interested and have the time. 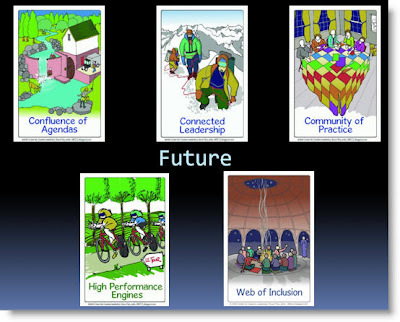 I used the LME cards to support a learning module on leading innovation and deliver on the objective to understand the leadership behaviors and cultural attributes enabling innovation. Since this module was part of a leadership development program that had been custom developed for one company, I also designed the exercise to deliver on the broader program goal of network and colleague development. To work within the available time, a pre-determined mix of enabling and disabling cards were distributed to four groups of four participants each. The morning began with an interactive discussion of product life-cycles and how organization culture and leaders evolve as products succeed and organizations grow. This was followed by an exploration of the unique types of innovation; process, sustaining (incremental) and disruptive (new-growth). 3. The ways in which leaders display such disabling behaviors or organization culture works to send out these subtle messages. 3. The ways in which leaders display and cultures support such enabling behaviors. Polarity of Opposites coming together, with the help of involved, knowledgeable Player Coaches, can organize and integrate a Community of (diverse) Craftspeople to set sail together as Ambitious Pioneers charting a new course. Each table captured their key messages from the cards and discussions that spontaneously followed, thus enabling the participants to begin building their own vision for innovation leadership. The Leadership Metaphor Explorer cards were enthusiastically received. There was absolutely no hesitancy to get involved. The differences in first impressions of the images led to both laughter and focused listening to one another. Participants easily collaborated, and I witnessed better brainstorming technique during these discussions than had been accomplished during an earlier brainstorm practice. Importantly, the LME experience also heightened the awareness of how perspectives differ when viewing the same image (or situation), what can be learned through effective sharing of the perspectives as well as the dialog skills and time required to share the perspectives. b. To allow for more discussion and collaborative work with these images. For example, one member at a table selected “A Polarity of Opposites” as an enabling card. A colleague challenged him that there was a wall separating the two sides from each other. A third participant at the table immediately pointed out that it looked like the wall was crumbling, while the fourth admitted that he had not even seen the wall in the image because he was focused on the meaning of the color vs. black and white difference. They were well on their way to a rich conversation when time ran out. 2. A deck without captions. To some degree, I feel as if the captions set boundaries on the messages of the images. Thank you for the early use of these cards. The LME is a wonderful tool that lends itself to a wide range of leadership, cultural and community-building explorations at an individual or group level. I also think they can be a valuable reflection and discussion tool for leadership coaches, and look forward to working with the LME in that capacity soon. 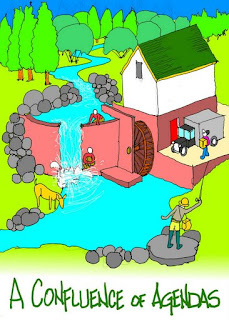 David Magellan Horth provides this field report on using Leadership Metaphor Explorer (LME) and Visual Explorer (VE) to address skills for contemporary leadership. The following design was used successful at the Library Leadership and Management Association LLAMA (a Division of the American Library Association – ALA at the LLAMA President’s meeting June 2008 in Annaheim, CA. I was expecting about 10 people but more like 300 people came so I had to think quickly on my feet. 2. I put on one LME Card and one VE Card face down on each chair, randomly distributed. your organization at its worst? how leadership is practiced currently? how leadership is when your organization is at its best? how you would like leadership to be in the future? how leadership needs to be in order to resolve your most pressing leadership challenges? 4. People were then invited to come to the microphone with the card they had been assigned. The microphone had been set up in the center aisle to share what they had found. This was very rich. About 7 people came forward before I moved on to the next part of the session. They shared both the metaphor and insights they had gained. 6. I then presented the Sense Making Loop used as a response to complex challenges. 7. There was a VE image at each seat. I asked them to think of a complex challenge in their organization. How does the visual image you have been assigned describe your complex challenge? 8. Again I had people come up to the microphone to share insights on the process and what they learned. 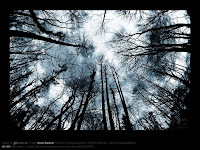 One woman chose the snails eye view of trees as a metaphor for appreciating diversity. I rounded things off by reciting a verse from T.S. Eliot, East Coker, to close. The Leadership Metaphor Explorer Cards were a supreme hit with multiple federal agencies represented at today’s Center Connection at the Treasury Executive Institute. This was the initial event for the morning. Next we asked them to select a metaphor card that represented this current state of affairs in talent development (this is step 1R in the 4MAT Model). There were 5 tables with a deck of Metaphor Cards at each table. I asked them to spread them out so that all were visible. They did so immediately and enthusiastically and began to exchange their reactions to the cards (we did not have to tell them to do this). They each selected a card, sometimes two. We had them exchange with each other their adjectives and the reason they selected the card(s). This took 10 minutes. When we asked them to report out, we received comments such as “I can’t believe that we were able to describe our situation in such a short period of time”. Lastly, we did a Visual Explorer session. Here we asked, them to select one image that represented what they needed to do differently in their organizations given what they learned today. I literally took them on a gallery walk with almost all of the VE images on display to insure that they saw them all (we were constrained as to space) and with a hand-held mike, I “led” the tour encouraging them to let the picture “grab” them. Worked well and then we had them do a table-top debrief using the Star Model. VE was a real hit as well. We let them keep their selected VE images as well as their selected ME images. Thank you for allowing me to use the metaphor cards. I have had one opportunity to use them to date, and see another opportunity coming up in a few weeks. You asked for feedback on use, and I am happy to provide it. I am presently teaching a course at Virginia Tech designated as an Advanced Topic in Management; the subtitle is “Creating and Sustaining High Performance Public Organizations.” There are 15 students — 12 are PhD candidates and 3 are Masters candidates — in two locations, Richmond and Alexandria, and they represent a mix of local and Federal organizations. I used the cards in the 3rd session, a joint Saturday session in Fredericksburg, in between Richmond and Alexandria. We shared a meal at a local Perkins restaurant, and went to a classroom at nearby Mary Washington College. I started the session by letting the students know we would be having a discussion followed by an exercise. The discussion began with the class brainstorming a number of characteristics of high performing organizations. Then we teased out the discussion of one of those characteristics — accountability. We talked about what the term meant operationally; how you would implement it; what would be consequences of failure to implement; and how you would measure it. This was a robust discussion. Next I laid out the cards on several tables. I asked the students to mill around the tables and to pick out one or two cards that spoke to them in respect to the challenge of creating a high performing organization. The organizational context could be either where they worked, some other organization, or an imaginary organization. The card(s) could speak to them in either in a negative or positive way. And I let them know they would be asked to share about the card(s) they pick. The sharing came fluently and progressively seamlessly as the discussion went along. By fluently, I mean that none of the students had trouble sharing, and in the process both self-disclosed and provided insights into their organization. By seamlessly, I mean that students hop on each others backs, linking their card to the one just previous. The discussion period last nearly an hour and a half. There was no given order for discussion. The way they took turns is, after someone shared, another person would say “Maria’s card reminded me of … ” and then they talked about their own card. Other cards used were critical parents, community of practice, preserved fossils, network of peers, steady navigators, and adventuresome explorers. There were no negative comments about the cards. The beauty of the card process is that there is no need for every card to resonate — as long as some do. To me, the success elements that need to surround the cards include: a warm up discussion, so that the brains are warm, ready to go; enough time to let people linger over the cards, to engage their intuitive side; and then the chance to share in a well-supported way. efficient use of time (the exercise took probably two times as long as it would with small groups), but accomplished the intended purpose. From my perspective as the instructor, the main purpose of the class was to create a sense of community in a class that is being “polycommed” to two locations. In my view the class was a success; some lesser known students got better heard in that class; and the students from the two campuses got to know each other better. My concern was not with efficient time use, and that is why I didn’t rush any part of the exercise. It was with effect, and the cards worked beautifully in that regard. My next possible use of the cards is as an “ice breaker” at an off-site “team-building”/picnic outing. Our group where I work has almost doubled to about 32 in the last month due to a re-organization. The way I want to use the cards is to create a discussion about managing change, and the number of changes the participants in the exercise are making and/or are going (or will go on) on in the organization. Then, I will invite people to pick cards of people that speak to them, and discuss. I really like the cards and the way they draw from the intuitive side of people’s brains. Our CCL colleague Clemson Turregano did an impromptu coaching session with his CEO client, using LME and the iLead (CCL’s customized version of the iPod Touch).